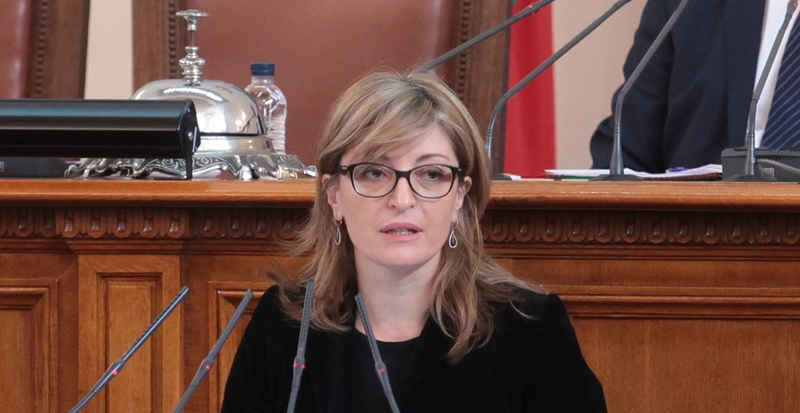 Bulgaria is systematically working together with other European Union countries to implement the activities outlined in the Sofia Declaration adopted in May 2018 at the EU-Western Balkans summit, Foreign Minister Ekaterina Zaharieva has told the National Assembly. The Sofia Declaration and the annex to it, known as the Sofia priority agenda, were signed on May 17 2018, at the meeting of the EU and Western Balkans leaders in the framework of the Bulgarian Presidency of the Council of the EU. The European integration of the Western Balkans was among the main priorities of the Bulgarian Presidency. “Our country is implementing initiatives with the Western Balkan countries that are active in this regard by sharing their experience of the accession process, border management, fight against terrorism and illicit trafficking, as well as the implementation of various joint projects,” Zaharieva said. “The immediate priority remains to improve physical and human connectivity to the benefit of the region and the EU,” Zaharieva said. Arising from the Sofia priority agenda, the European Commission has allocated an additional 190 million euro for road, rail and port infrastructure. The funds are intended for the implementation of 11 new projects. More than 300 km of railway lines will be modernised. Zaharieva said that implementation of this would make it possible, in just a few years, to cut the travelling time by train between Sofia and Belgrade to less than two hours. By the end of the year, a strategy for the development of the railway network in the region will be adopted. Plans are to build and modernise a total of 400km of road infrastructure, while Corridor 8, which will connect the Black Sea and the Adriatic Sea, remains a priority for Bulgaria. Zaharieva said that possibilities were being explored to modernise or open new border crossing points between the countries of the Western Balkans and between them and neighboring EU countries. Progress also has been made in the Energy Efficiency Package for the Western Balkans, for which at this stage 30 million euro of the EC budget is foreseen. “Major attention is paid to youth contacts. Projects in the fields of education and mobility are being developed, and the doubling of funding for Erasmus + by the end of 2020 is particularly important. This will increase the possibility for students from the Western Balkans to participate in projects in the EU, including in our country,” she said.